This is the most stunning ladies lanyard available! The entire lanyard is covered in rhinestones. 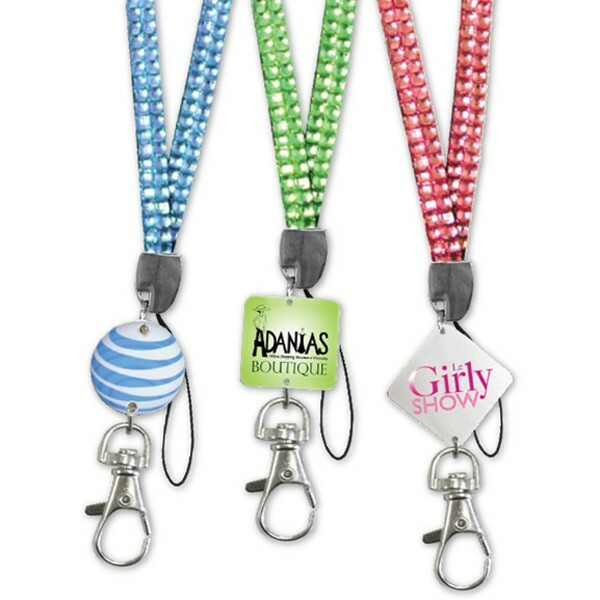 Better yet, your logo is printed on a metal plate and applied to the lanyard for perfect brand awareness. 13 colors available. Full color printing .Great for school, work, & VIP events! Make a fashion statement by ordering one today! Choose round, square or diamond shape charm. For an additional fee, add add an epoxy dome for a more elegant look! No Setup Fee! Available product colors: Silver, Black, Red, Orange, Blue, Lite Blue, Green, Lime green, Purple, Pink, Teal, Yellow, Mix. Price includes Full color on 1 side in 1 location. Indicate attachment choice. Check website for current available color & patterns.